Get more sales. Sell more software. Get on more software download sites. Get your product seen in more places and get more links to your site. EziSubmit is a great way to upload your shareware or freeware. Increase your site's page ranking in google so you move towards the top of search engine results pages. Search Engine Optimization (SEO) requires links. 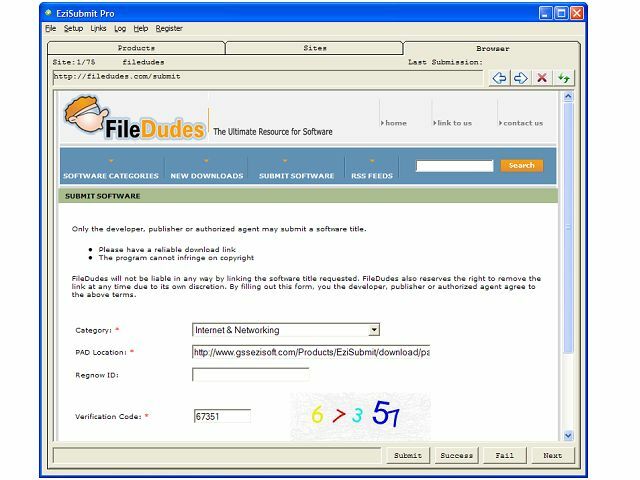 Submit PAD files for your programs to 400 (trial 50) software listing sites. EziSubmit allows you to submit your software to the download sites. ...... It knows the sites. It knows how to submit to those sites. Unlike many program uploading tools, EziSubmit is updatable by the user - YOU. If it doesn't already include your favorite sites, or if you hear of a new site that everyone is downloading from, you can add that site. You don't need to wait for an update. You don't need to pay for an update. If a website changes EziSubmit can change too. Did they change the submit page? Did they change the form? Do they require more information? EziSubmit can be updated in minutes to match. All you need is the manual and a text editor like Notepad. EziSubmit always records where you got to. EziSubmit always allows you to resume from where you left off. You can add your software to listing sites gradually. Qweas is providing links to EziSubmit Pro 1.00.0073 as a courtesy, and makes no representations regarding EziSubmit Pro or any other applications or any information related thereto. Any questions, complaints or claims regarding this application EziSubmit Pro 1.00.0073 must be directed to the appropriate software vendor. You may click the publisher link of EziSubmit Pro on the top of this page to get more details about the vendor.